In February 2016, dozens of participants representing disability rights advocates, disabled people’s organizations (DPOs) and other civil society groups convened in Colombo, Sri Lanka to discuss the rights of persons with disabilities in the electoral and constitutional reform process. Led by the Centre for Monitoring Election Violence (CMEV), the meeting launched an effort to develop and submit language to the constitutional reform committee to ensure that these rights are incorporated into Sri Lanka’s legal framework. This marked the first ever initiative of its kind. At the request of CMEV and DPOs, inclusion experts from the International Foundation for Electoral Systems (IFES) provided technical advice on international standards and best practices for ensuring rights of people with disabilities are recognized in a country’s legal framework, with support from the U.S. Agency for International Development (USAID). The international standards, provided in Sinhala, Tamil and braille, informed the civil society initiative by helping to translate international best practices on inclusion to Sri Lanka’s ongoing electoral and constitutional reform process. Many of the proposed standards were integrated into the final constitutional submission. These included language prohibiting the use of ‘unsound mind’ as a justification for limiting a citizens’ right to vote and run for office; establishing an independent council to advise government stakeholders on the rights of persons with disabilities; creating an Access to Elected Office Fund to provide accessible transport, sign language interpreters or other enabling conditions for candidates with disabilities; and explicitly promoting the political rights of women with disabilities. "I consider this submission of a proposal to include the voice of the persons with disabilities in the constitutional reforms as a major leap… It would enable all of us to engage with the decision making process of the country more proactively while advocating to secure our civil and political rights." 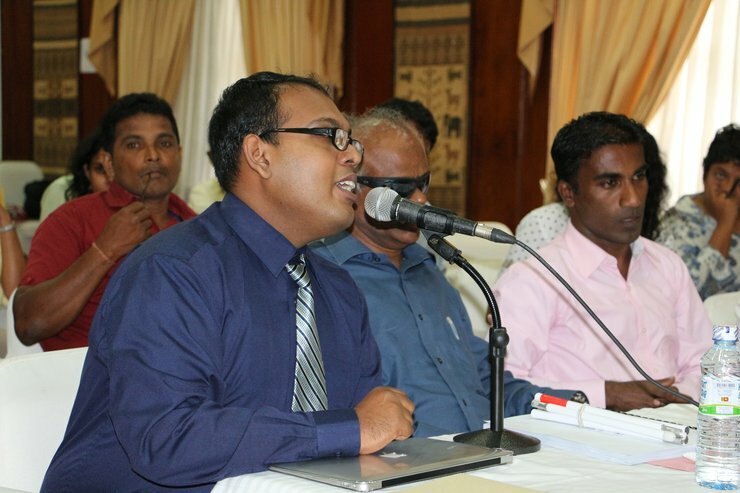 On March 4, 2016, following an inclusive consultative process, this informal network of disability advocates representing over 30 civil society and disabled people’s organizations delivered their newly-drafted disability rights’ language to Sri Lanka’s Public Representations Committee on Constitutional Reforms. Through this and other efforts, IFES’ Improved Election Management Program continues to support USAID’s focus on advancing disability-inclusive development as part of a strengthened democratic process. IFES promotes democratic stability, active citizen participation and strong civil society, governance and transparency worldwide. Since 1997, IFES has led disability rights initiatives in coordination with local partners in over 50 countries to advance the electoral and political enfranchisement of men and women with disabilities. As part of the USAID-funded Improved Election Management Program in Sri Lanka, IFES is providing technical support to a network of disability rights advocates working to ensure that the rights of persons with disabilities are integrated into the ongoing electoral reform process.